In my next post I’m going to explain the changes I went through, style-wise, while bringing“Angels Calling” to form. This may seem self-indulgent, but it will be a worthwhile exercise for me, and hopefully there will be something you might learn as well? At the very least there will be lots of pictures to see! This has turned out to be more difficult than I thought . . . it’s very much like trying to put something special into words, even though you know it’s pretty much impossible to fully do so. That has certainly been the case with this this blog, though it’s easier if I focus more on technical things that happened through the month. For example, I went back to sketching in curves that were never there in the first place . . . it’s very much like doing the sketch after the painting is done . . . it turns out this is quite opposite of the norm. I learned that while watching an intriguing documentary about the Dutch Master, Johannes Vermeer . . . his painting, and especially his technique. For me it raises a lot of issues that surround “what art is” and the misconceptions about digital painting. There’s also this curious issue of painting with light . . . apparently that’s not supposed to be possible, but I didn’t though that . . . it feels like I’ve been doing that for years now. It’s a fascinating film in that context, especially since the mystery of Vermeer has lasted over 300 years. The findings in the film can be a little disturbing to some art lovers . . . it was that way for me. To avoid any spoilers, you can see the trailer here if you like: a documentary called “Tim’s Vermeer”. In many ways this project was a blurring of previous ones, though it felt more like a fine blending by the time it was finished. For the first time ever, I spent some quality time looking back on my development. It happened differently through each of three major stages of detailing . . . always unexpected. As a reminder, the project I’m talking about is “Angels Calling”. It consumed my October, and during this month I went back to study at least half dozen pieces, ones I’ve done over the past decade. I’d compare some aspect of the current project to one of those older pictures. Then immediately I’d notice something nice about my own progression. Sometimes the changes are subtle, other times stark, and always a little amusing, but not in any nostalgic way. This happened with every old picture that came to mind. Oddly though, these were also breakthrough pictures for me personally, usually involving new tools or applications of old ones – the personal “wow” moments. Taken all together, this led to an immense sense of calmness, like finding balance in a new way, and certainly style-wise. It’s a really good feeling. Finally, I mentioned a series of 41 renditions in the progression of “Angels Calling”. How it works is that every time I make a fundamental change to a rendition, I save it as the next highest rendition number. That way I can sit back and see if each change is for the better. If so, then the higher numbered version becomes my new work-in-progress. It’s an elegantly simple system, and it works beautifully. Still, it’s not always easy to decide whether an improvement has been made, or if the previous rendition is the better one. However, in the making of this picture, it was all a very smooth process. One rendition pretty much flowed into the next. It was never a struggle, yet still challenging . . . demanding a lot of patience and just as much attention to countless details. So here are some “snapshots” of various renditions . . . the numbers are noted in the captions. Thank you for spending your time on this post, and I hope you enjoy the view. 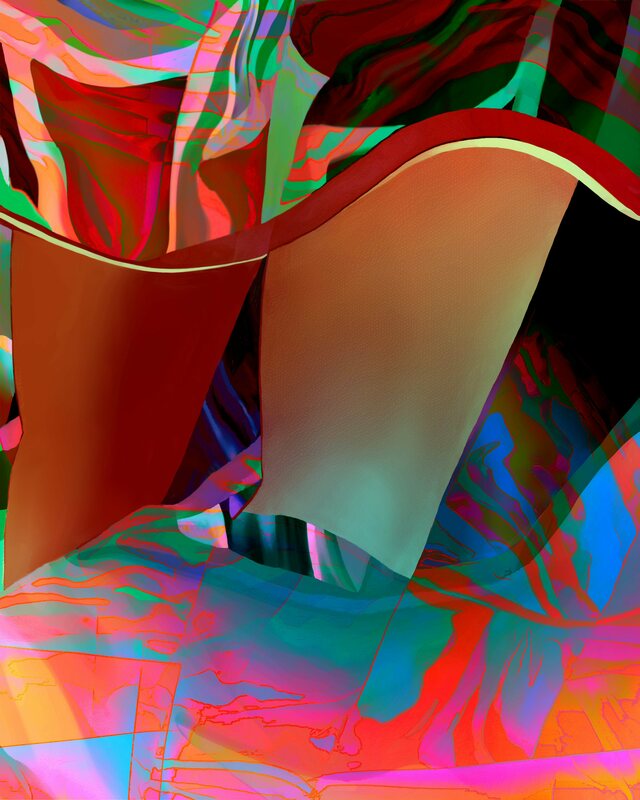 This entry was posted in Art, Fine Art America, Uncategorized and tagged abstract art, Art, Inspiration, Johannes Vermeer on November 14, 2014 by Lawrence Grodecki.